On the anniversary of the 1999 Columbine High School massacre, it's worth asking whether the assault weapons ban, which was in effect during the time, actually worked. Analysis of 108 shootings with five or more deaths showed that the ban was more successful than in years where there wasn't a ban, and such mass shootings have dramatically increased since the ban expired. The Columbine shooting by a pair of students which killed 13 at the Colorado school, has been held up by assault weapons ban opponents as a reason why the ban didn't work, listing each case of a shooting (whether they involved assault weapons or not). But focusing on cases from a decade doesn't tell us much about all of the shootings over years before and after the ban, to see if the ban actually reduced such mass killings. To analyze the issue, I look at all rampage killings, school shootings, workplace shootings, family massacres and mass killings over religion, race and politics, from 1973 to the present. Each case analyzed had five or more deaths, with many wounded. In this study of 108 mass shootings, 92 of them occurred before the assault weapons ban, and after it as well, with only 16 mass shootings in the ten years in which we had an assault weapons ban. If you divide those by the number of years (34 for non-ban years and 10 for ban years), you find that we had 2.71 shootings per year in non-ban years, and 1.6 shootings per ban year. That means we had 1.69 times as many mass shootings in non-ban years. Let's break it down by the timing of the shooting. Before the assault weapons ban, there were 2.04 mass shootings per year (1973-1994). So the ban did reduce the number of mass shootings. What's even more frightening is what happened in the 11 years after the assault weapons ban was allowed by the GOP Congress to expire. 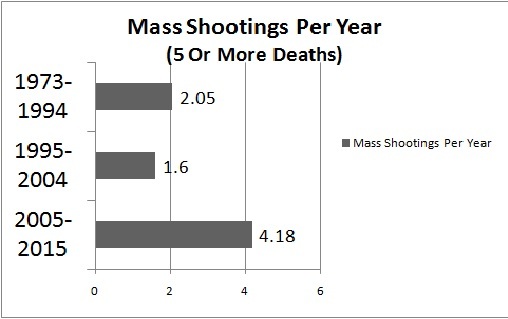 We had 46 mass shootings per year from 2005 to 2015, or 4.18 mass shootings per year. That's more than 2.61 times as many mass shootings as when we had the assault weapons ban. Critics are likely to claim that other means of killings were frequently employed during the years of the assault weapons ban. That isn't supported either by the evidence. There were four cases of vehicular killings with three or more dead and 10 or more injured between 1973 and the present. None happened during the assault weapons ban. The same can be said of causing deadly fires and plane crashes (four cases, none during the ban). There was the bombing of the Alfred P. Murrah Federal building by a domestic terrorist, of course. Those who support gun control have hyped each shooting. But it hasn't translated into support for restricting firearms. Instead, it's had the opposite effect, making people more willing to support gun rights, or go out and buy a firearm. Gun control advocates need to show how laws like assault weapons ban worked, in America, Europe, Australia, etc. Yes, there were tragedies during the ban, like Columbine. Perhaps more draconian punishments and civil suits against those who helped provide the weapons for the killers might deter future straw purchases. But even with the horrible event of 1999, the data shows that the assault weapons ban reduced mass shootings in America, and letting the ban expire dramatically increased the number of mass shootings in the United States.